We have everything covered. Enjoy relaxing in our sports bar area tasting our new cask ales whilst watching the live sports events. Enjoy a refreshing bottle of Prosecco or catch up with friends whilst watching the very best live sport. 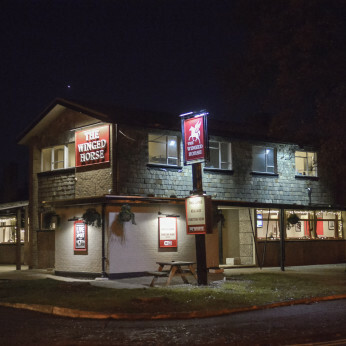 Like us on Facebook and sign up to our mailing list to hear the latest news, live events and offerings at The Winged Horse. The Winged Horse and local charity BASIS - Befriending for Blind and Sight Impaired, are teaming up to put on a festive lunch for people living locally who could do with some companionship this Christmas.